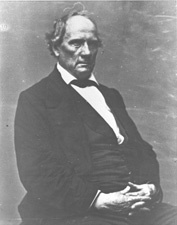 JAMES, Charles Tillinghast, a Senator from Rhode Island; born in West Greenwich Center, Kent County, R.I., September 15, 1805; attended the common schools; in early youth moved to Providence, R.I., and learned the trade of a carpenter; subsequently became an expert textile machinist; erected cotton mills in Rhode Island, New York, Pennsylvania, Indiana, and Tennessee; served as major general of the Rhode Island Militia; elected as a Democrat to the United States Senate and served from March 4, 1851, to March 3, 1857; was not a candidate for reelection in 1856; chairman, Committee on Patents and the Patent Office (Thirty-second through Thirty-fourth Congresses) and Committee on Public Buildings (Thirty-second and Thirty-third Congresses); devoted his time to the improvement of firearms; died of wounds received from the explosion of a shell of his own manufacture with which he was experimenting at Sag Harbor, N.Y., on October 17, 1862; interment in Swan Point Cemetery, Providence, R.I. Dictionary of American Biography; James, Charles T. Letters on the Culture and Manufacture of Cotton. New York: Geo. W. Wood, 1850.